This is a rare image of one of the five transcendental Buddhas of the Vajrayana pantheon. He holds attributes of both Vajrasatva and Manjusri, two other important Buddhist deities, and is accompanied by four goddesses. Noteworthy are the multiple heads and arms, which signify the figures cosmic nature, and the leaping tongues of flames in the background. 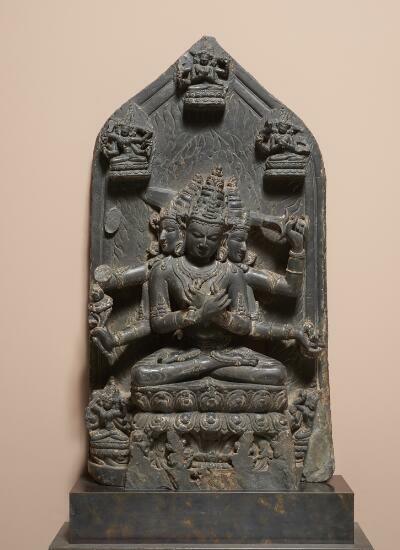 This complex stele, with its unusual arrangement of Buddhas and Goddesses, probably served a specific Tantric Buddhist ritual. The main figure, sitting on a lotus throne with three smiling heads and six arms, is a Buddhist deity, possibly Vajrasatva. His crossed hands hold a bell and a thunderbolt in a gesture that symbolizes compassion and wisdom, the two essential ingredients for enlightenment. Two of his outstretched hands hold a lotus and a jewel, and he wields a sword dramatically above him. Flames flicker outwards from his body representing his divine power. A Buddha resembling Vajrasatva hovers at the very top of the stele, as if lifted by the fire’s updraft. Arrangements like this one are associated with complex esoteric beliefs and practices. Used as meditation aides, they are part of the daily practice of the faithful.